"There's no 'I' in 'team', but there's an 'I' in 'pie.' And there's an 'I' in 'meat pie.' The anagram of 'meat' is 'team'..."
If I told you that I had an idea for a restaurant that specialized in meat pies, would you tell me it sounded as gimmicky as joints who do low-carb wraps or food served in Crispy Cones? Would you tell me that meat pies might sell in Great Britain but never in health-conscious California? Would you ask me, "Who'd pay $5 for a glorified Hot Pocket?" What if I told you that I'd design my meat pies so that it can be eaten on-the-go, handheld like so many sandwiches, made with gourmet ingredients? What if I told you that I'd spruce up the place with professionally shot glossies of preening models with Colgate smiles eating my pies? What if I told you I'd offer a range of garden salads, soups, and more than a dozen varieties of fillings, some with globe-trekking appeal and jazzy names like Chipotle Chicken Fajita and Spicy Chicken Kung Pao Wow? What if I told you my target market was upwardly mobile professionals looking for an alternative to the usual fast-food vittles? Then what if I showed you a business plan which detailed how my meat pie empire would franchise, ready and poised to entice the burger and fries crowd away from the Golden Arches? The Cravery was undoubtedly borne out of such a pitch. Founded by a USC MBA and his uncle, a professional baker with years of experience in the food business, the restaurant reeks of careful thought and planning. The corporate touch is evident from the cute little name tags pinned on top of each pie, to the immaculately designed logo carved out on each seatback. 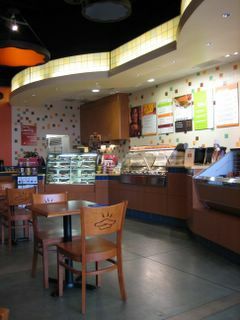 Usually, with high concept places like this, the food takes a back seat to the design and marketing. But surprisingly, the pies were actually quite tasty, eventhough they were plucked out from under a display case equipped with heat lamps. 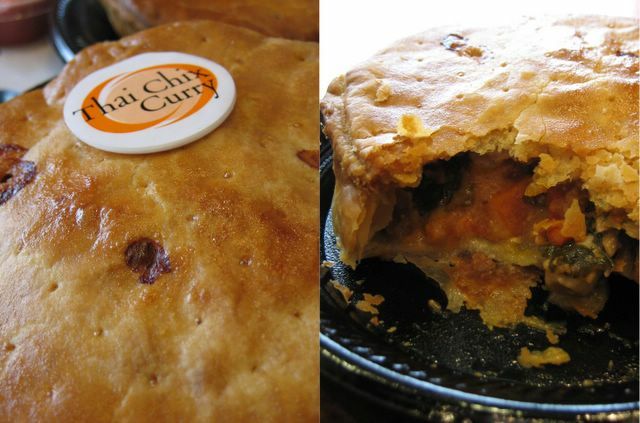 Although it didn't taste like any Thai curry I've ever had, the Kickin' Thai Curry Chicken pie ($5.25) was still vaguely Asian, with chunks of white chicken, wilted red bell pepper, button mushrooms, and a sauce accented with garlic, lemon, and ginger. The pie crust that held it in was a sturdy construct. Flaky, buttery, like a good Spanish empanada, I ate it on a plate with a fork and knife. I didn't test out how the pie would fare if I held it aloft like a sandwich, but judging by the crumbs accumulating on my plate, I'd sooner eat a Sloppy Joe in my car, unless I had a dustbuster at the ready. For a few bucks more ($7.50), you can pair the pie with a salad or soup. 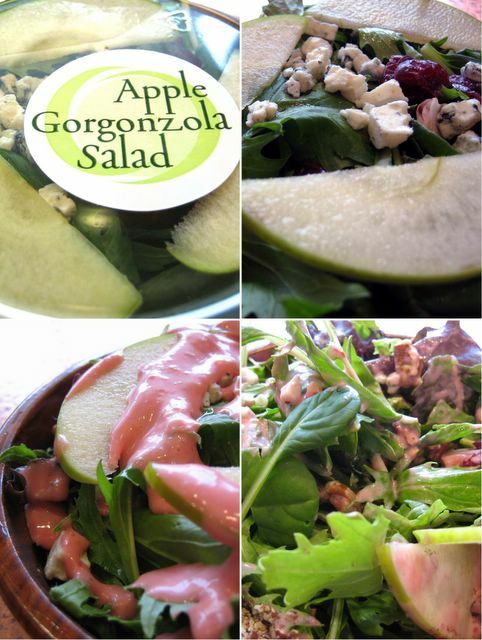 I chose the Apple Gorgonzola Salad, from a refrigerated shelf. Dried cranberries, three thin slices of sour green apple, and cubed crumbles of the tangy cheese topped a bowl of field greens. A plastic satchel of creamy raspberry dressing and a packet of crushed pecans came on the side. Assembly was required, but the result of my efforts was a salad that was quite refreshing. The tart apple nicely contrasted the rich and heady gorgonzola, and the bitterness of the baby spinach in particular, tamed the cloying sweetness of the dressing. Still not sold on the concept of a meat pie restaurant? Well, I can tell you it's a better idea than a shop that only sells muffin tops. Doesn't sound too bad. More appealing than Panera Bread,in any case. The meat pie idea actually reminds me of pasties, which are actually quite popular in parts of Michigan. Especially the U.P. I've been to The Cravery quite a bit. It's a nice little place. I've tried most of their pies, even their turkey pies that they had during the last Thanksgiving season. Well, things look respectable here, but I am rather put off by the fact that heat lamps are keeping things from being chilly. I would think that after a certain amount of time (say, 10 minutes), the pastry would start to deteriorate and become mushy. I don't know, elmo. Sounds somewhat iffy to me. I guess I would rather take the time to wait for fresh-from-the-oven meat pies. It is a brilliant idea. I would've loved to read the business plan for ventures such as this one and the one from "Top Chef". Time will tell which one will rise up above the rest. You're right about Panera Bread. At least this one feels like it has a soul and the food is actually edible. And I'd rather eat pasties and pies than a wrap. BTW, what is the U.P.? I would've liked to have tried that Turkey pie. I bet it had a nice gravy in it. I heard also that the black pepper beef is good. Might have to try it. The one thing that turns me off more than the heat lamps is actually the price. $5.25 for one smallish pie is actually pretty steep in my opinion. But then again, I guess I'm spoiled by $1 to $2 banh mis! Seth, I've had pies straight out of the oven from there before. so jellis. makes me want to live in Irvine! in the ren & stimpy episode "space madness", ren dreams of chicken pot pie whilst in the bathtub. obviously, he was dreaming of this place. LOL! and i love that you quoted shaun of the dead. so funny! Hi Elmo, I was in Yahoo looking for Toko Rame when I stumbled onto your blog. Nice! We will be going down to So Cal area and my dh went to TR last year & liked it a lot. Besides the fish nasi bungkus, what else would you recommend? I just want to say "hi". I've been reading your blog for some time now. I also live around Irvine area and I've been to many of your recommendations. Keep up the good work. I'll definitely want to contribute in finding good eateries around the area. Thanks! Now I'm remembering that I saw "The U.P." being mentioned a lot on the travel brochures at my hotel when I was in Michigan not so many months ago. I too had the opportunity to eat a pie right out of the oven as they were making a fresh batch when I made this trip. Except I would've had to wait 15 minutes for the pies to cook. Come join us! We'd be happy to have you as a neighbor. And I love that you referenced Ren and Stimpy! Thanks and welcome to my blog! As for Toko Rame, I've actually haven't been there since that last visit you read about. The Nasi Bungkus is definitely one of their bests. I think the gado-gado looked good too. The cooks are from Padang, so you also can't go wrong with anything that is extra spicy. Thanks for writing in! I hope to have more posts soon that you'll hopefully like. Give us some recs too if you've got a hot tip! Thanks for the reviews as always! I am looking forward to trying tropika, as I just went to the redondo place for the first time a couple weeks ago. Coming from NYC and having known many malaysians and singaporeans from uni, I found that place very very lacking. But I'm still very optimistic about tropika :). Cheers! Hey thanks for writing in and for reading my blog! Actually, it was I who made the comment about the price. I didn't include in my actual posting (maybe I should've), but yes I do personally think it's quite expensive for what you get. I should've also mentioned that I used a coupon, which decreased the sting a little. If you try Tropika, let me know what you think! Reading the comments on that post, it seems like half of the people loved it and the other half, not so much. Went back yesterday and got a pastrami sandwich that they made for me fresh on the spot. It was quite good and cheaper than one of the pot pies. I was passing by the other day and saw the picture of that pastrami sandwich. Looked so tasty I was going to go in to try it...unfortunately I had something planned for dinner already. How much is the sandwich BTW? however, i will be down in aliso viejo, wondering if theres any good eats you could recommend? because from looking at your pictures i trust your judgement, definitely. haha thanks and take care! Unfortunately, I don't go too often to Aliso Viejo. I think the closest recommendation I have for you is in Laguna Hills, for King's Fish House. Here's my review if you haven't already read it. Other than that, hmm...perhaps some of my other readers might have suggestions. Maybe the Chowhounds might know of a few places there as well. I’m coming into this conversation a little late, but I would still like to comment. I love eating at The Cravery, and actually have eaten the pies in my car and while I’ve been walking around. If you cut anything with a knife and fork it will leave a bigger mess than if you just eat it with your hands. The pies really don’t leave a big mess, especially when you get the sleeve they put them in when you get the pies to-go. Next time, I think you should try doing something before you assume how it will work. Also, I’m really glad they have the heated case that they temporarily store the pies in; because it makes it really easy to get in and get out when you’re in a hurry. The Cravery is probably the best food that I’ve ever had fast-food style. Thanks for letting me know that the pies don't fall apart when eaten in the car. It sounds like you've got eating on the go down! Kudos to you. I bow to the queen of pie eating. Tell me, what else have you eaten in a car? Thanks for sharing your experience. The price is the part which stings the most for me, and actually I haven't been back since this visit because I haven't gotten a hold of more coupons. Went to the area today and the place has been closed. I tried this place once; like the pie, but it IS too expensive.